"This has moved from cultural terrorism to corporate terrorism. That's what this is. Now, back in the 80's and early 90's I worked with the state department in anti-terrorism and we trained about fifty different countries in defending against terrorism, and it's, at it's base, what terrorism is, it's a strike against the general populace simply to spread fear and intimidation so that they can disrupt and destabilize the system of government. That's what the homosexuals are doing here to the legal system." 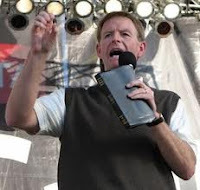 - Hate group leader Tony Perkins, on King & Spalding's DOMA withdrawal. Just three days ago we were cowards, now we're terrorists. Make up your diseased mind, Miss Perkins.